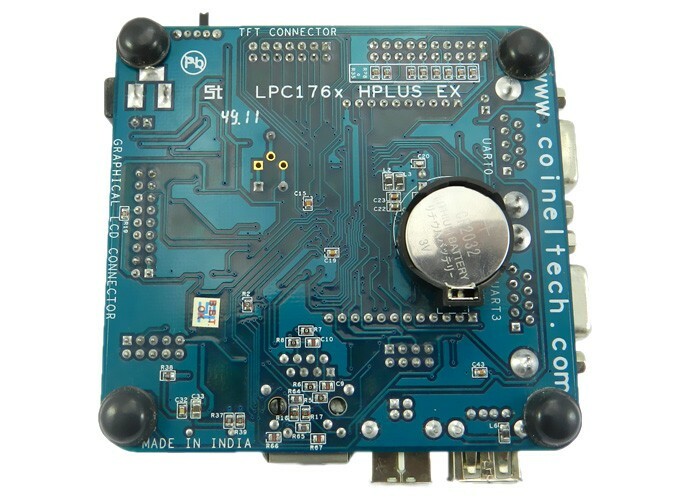 LPC176x HPLUS Ex Board has an onboard Cortex M3 core microcontroller (LPC1768). 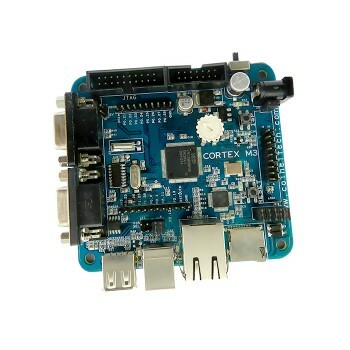 This board has connectivity options similar to that of HPLUS Board which include Micro SDCard, Ethernet, USB Host/Device, 3.2inch and 3.5inch TFT connectivity option, JTAG etc. 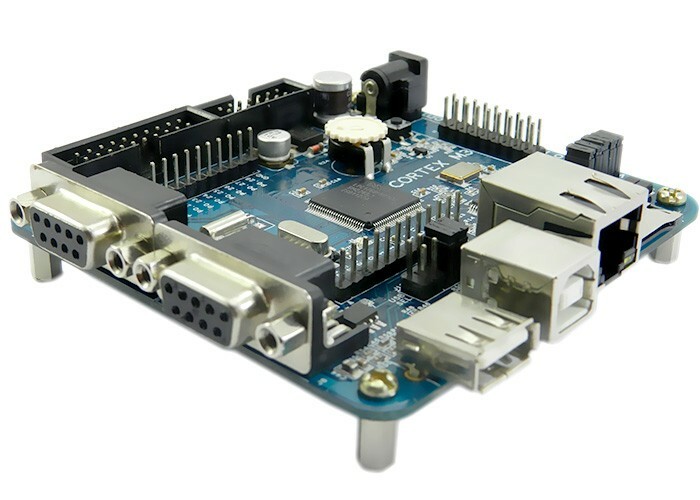 Along with these features, the Ex Board has additional features of two RS232 interface plus a connectivity option for 128x64 Graphical LCD. The display connectivity options are available for the following display units. Note: 3.5inch TFT is currently not available. CD Containing schematic, sample source codes, required software and reference documents. Note: JTAG Programmer/Debugger is not the part of the package and needs to be purchased separately. USB Device and Host Connectivity Options. Ethernet with DP83848 PHY MAC. OnBoard Reset and ISP Switches. 32.768 KHz Clock for RTC. Option for a CMOS Battery. Onboard 20 pin JTAG connector for debugging/programming applications. On board TFT Connector for 3.2inch TFT (with touch and without touch). On Board Graphical LCD Connector. LED for Power Supply, USB, Ethernet and Test LED. Best in class Cortex M3 Hardware. 100 MHz ARM Core with 64 KB of SRAM and 512 KB Flash. 8-channel general purpose DMA controller, 4 UARTs, 2 CAN channels, 2 SSP controllers, SPI interface, 3 I2C interfaces, 2-input plus 2-output I2S interface, 8-channel 12-bit ADC, 10-bit DAC, motor control PWM, Quadrature Encoder interface, 4 general purpose timers, 6-output general purpose PWM, ultra-low power RTC with separate battery supply, and up to 70 general purpose I/O pins. The Board can also be used with other compatible JTAG Debuggers. The details on how to use the JTAG and its associated plugins are provided with the documents and also can be downloaded from Download section. Programming can be done through the on chip boot loader using UART interface (UART0). You will have to use a TTL to RS232 Converter to do so since the pinout are TTL logic and PC uses RS232 logic. The tool used for programming is Flash Magic. 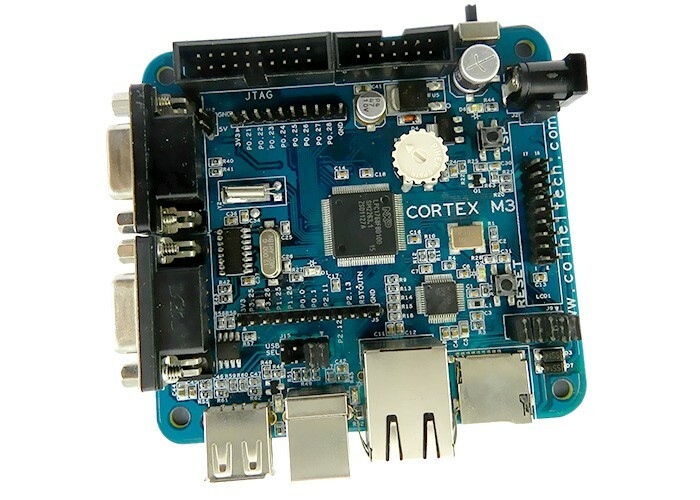 The controller can be Programmed using CoFlash from CooCox. The binary file needs to loaded using this tool. You can download the tool in the download section. To use CoFlash, you would need CoiNel ARM USB JTAG or CoiNel CoLinkEx. The Board can also be programmed via USB Secondary Bootloader. Check LPC1768 USB Boot Loader document for more details. Our products can be used with majority of IDE and plugins that support Cortex M3 family. A few IDE and plugin details are given below. H-JTAG, CooCox Colink, Flash Magic have been tested.